Let’s face it – we as consumers do not always believe the claims that are made by companies in advertisements. We are skeptical when companies make grandiose claims about how great their products are: brighter, fresher, cleaner, lovelier, sexier, smarter, healthier, and all that jazz. We want to see the proof – or in the case of Febreze, we want to smell the proof. To prove the point about Febreze eliminating bad odors, they created a “live smell test lab.” Using a container that had been used to ship seafood, it was dropped into the Meatpacking District of New York city. With a window in place, lots of Febreze plug-ins, and some furniture, unsuspecting people were approached on nearby streets, blindfolded, brought to the container, and asked to identify the smells and location where they were at. The responses lived up to Frebreze’s claims on eliminating odors and making the room smell fresh. 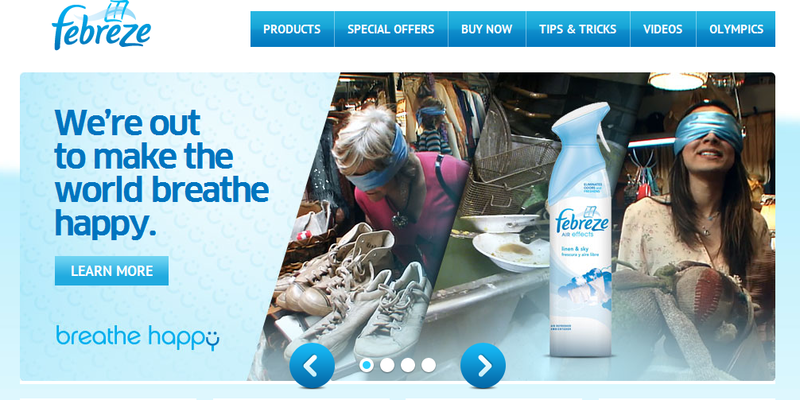 The folks handling the marketing at Proctor & Gamble for Febreze understand consumer behavior. Consumers trust our own experiences – and even other consumers – long before they trust a company’s claim. Do they believe these claims? Why or why not? Will this be effective in proving the company’s message? What else could be done? Have the student list a number of product categories for items found in their homes. Next, ask students to apply the concepts Febreze used to other household products. Using this type of experiential marketing approach, how could similar promotions be conducted for other household products?